I had only just returned from Scotland 10 days earlier (and took a few days to recuperate from jet-lag), I didn’t have as many samples ready as I normally do for this event. 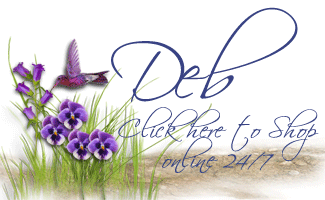 No worries – my team mate Lynn to the rescue!! Lynn kindly came to my rescue, and lent me several of her samples, as her open house is this coming Friday! It’s so great to have team members who can help out in a pinch – teamwork makes the team, work :)! 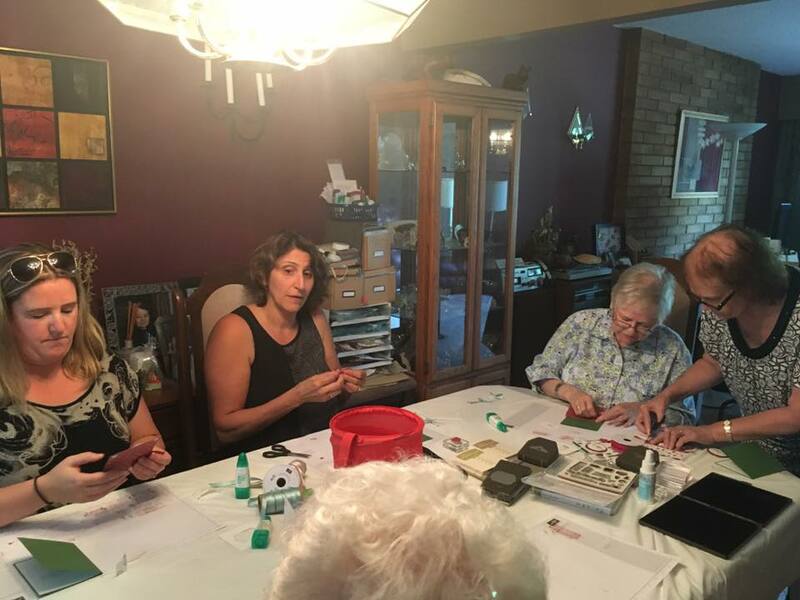 (in turn, I’m lending my sample to Lynn for her open house!). A little sparse, right? 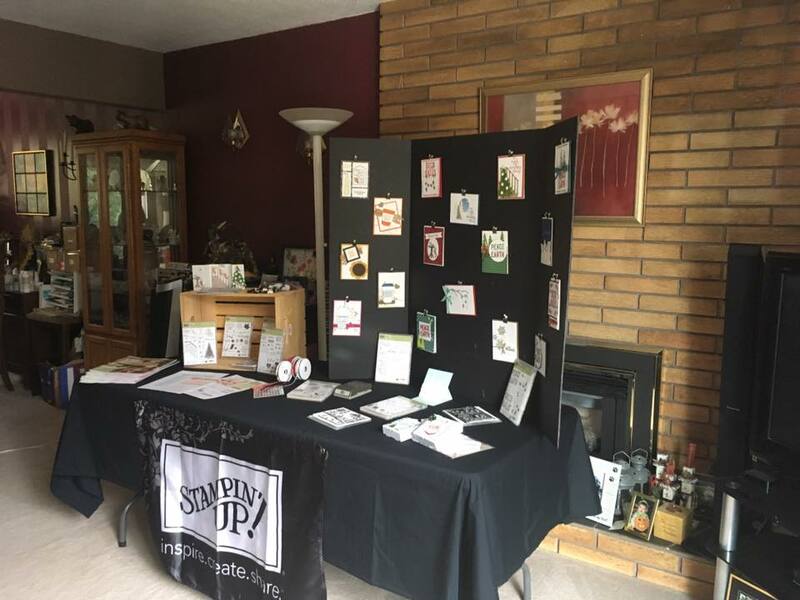 Of course, I forgot to take a picture of it after I added Lynn’s cards – because then guests started arriving! I did have lots of fun creating the samples, and I’ll be sharing them with you over the next few days. The Merry Little Labels set at first glance looks like it’s just for labels or tags. However, the great images and sentiments can easily be used on full cards, as well! Using the coordinating Everyday Label Punch makes it easy to punch out 4 or the stamps, and the other 2 coordinate with our Layering Ovals Framelits and 2 1/4″ Circle Punch. Or, as I said – stamp directly onto your card front! 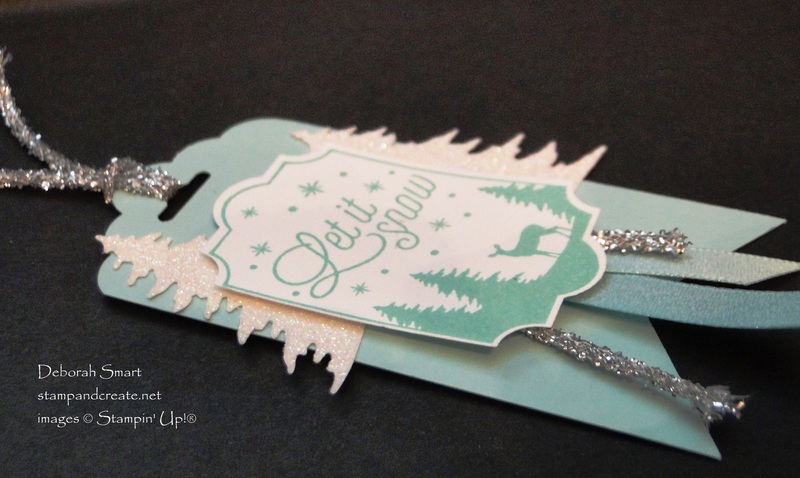 We used the beautiful ‘Let it Snow’ stamp for our tag; have a look. This tag could easily be added to a card front just the way it is – simply add it to an embossed panel for a gorgeous, quick & easy card! I love the frost combination of blue and silver! This look is created using Pool Party cardstock, ink and the new Shimmer Ribbon in Pool Party, along with Whisper White and Dazzling Diamonds cardstock. The addition of the new Tinsel Trim in Silver finishes it off perfectly! The image is inked with Pool Party ink, and stamped onto Whisper White cardstock. It’s then punched out using the Everyday Label Punch. The trees are die cut from Dazzling Diamonds cardstock, using the Card Front Builder Thinlits and the Big Shot. I used the duo tree thinlit, but snipped them apart to work better with my placement behind the tag. The banner background is created by cutting a 2″ wide by 4 1/2″ long piece of Pool Party cardstock. Use the Scalloped Tag Topper Punch on one end, then the Banner Triple Punch for the bottom. Voila – a quick & easy tag background. 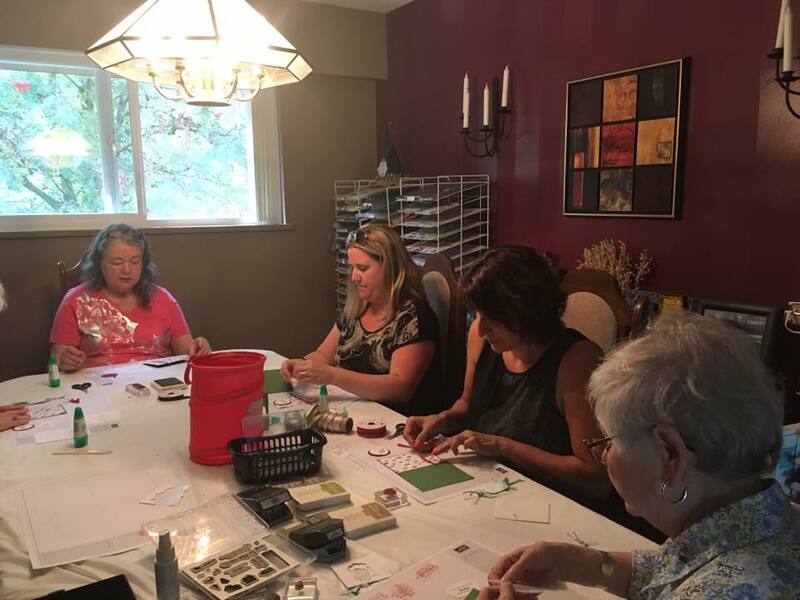 Once you have your pieces stamped, punched and die cut, the assembly is quick & easy! Use the Multipurpose Liquid Glue to attach the trees to the Pool Party banner, offsetting them slightly, and towards each side. 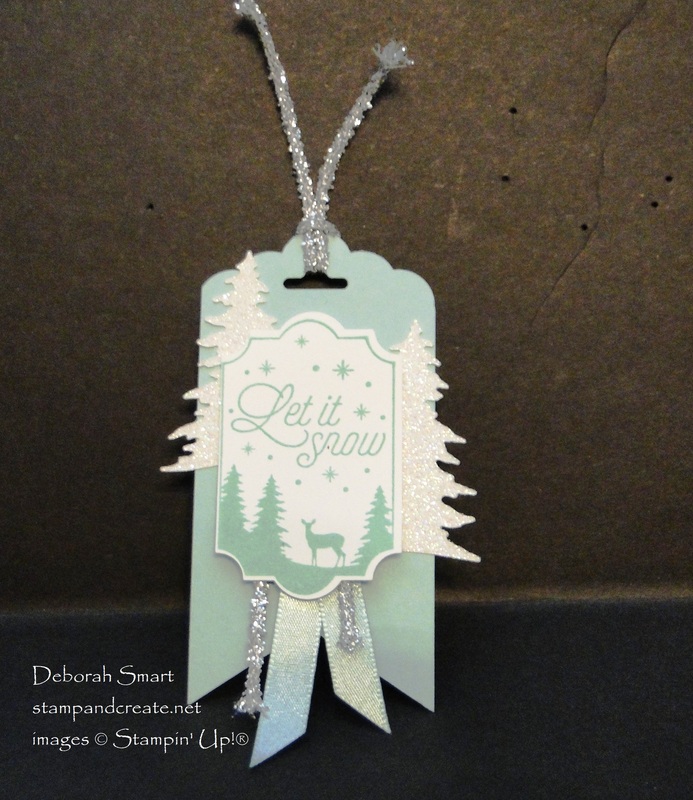 Next, attach the ribbon and Tinsel Trim to the back of the stamped tag using Stampin’ Dimensionals, then attach it to the banner using more Dimensionals. Loop a length of the Tinsel Trim through the banner top, and you’re done! Order the supplies to make this tag yourself, from my online store! It’s open 24/7, so you can shop whenever is convenient for you. Click on the images below and you’ll be taken directly there. If you’d rather have me place your order, just send me an email and I’ll take care of it! I’ll be back tomorrow to share the card that we made – see you then!